AARP Illinois state director Bob Gallo questioned the efficacy of doing motorist outreach (“High Visibility Crosswalk Enforcement”) when red light running is “epidemic” in Chicago. 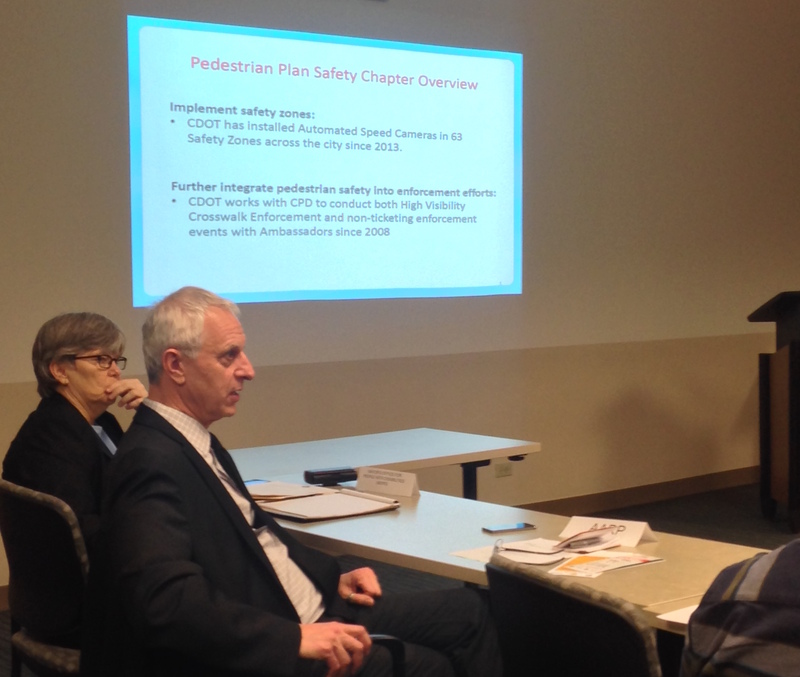 At yesterday’s quarterly meeting of the Mayor’s Pedestrian Advisory Council, Chicago Department of Transportation commissioner Rebekah Scheinfeld mentioned the “somber” statistics that there was a significant increase in Chicago pedestrian fatalities in 2015 compared to previous years. There were 35 pedestrian deaths in the city in 2014, according to official Illinois Department of Transportation figures, and 46 fatalities in 2015, according to unofficial figures from the Chicago Police Department – a 24-percent increase. IDOT data for 2015 won’t be available until the fall. “Vision Zero is an international traffic safety movement guided by the principle that no loss of life on our streets is acceptable,” explained Active Transportation Alliance campaign director Kyle Whitehead in a blog post last week. Nearly a year ago, the group noted that Chicago had already created several resources for analyzing what’s causing crashes throughout the city and determining how they can be prevented, including the Chicago Pedestrian Plan, the Streets for Cycling Plan 2020 and Chicago Forward Action Agenda. However, they noted that there was no Vision Zero action plan at the time – which is still true today. Scheinfeld noted two trends that CDOT has seen among last year’s pedestrian fatalities. Despite the growing number of speed cameras in the city, she said “we still saw a significant amount” of pedestrian fatalities “hit by motor vehicles that were moving at excessively high speeds.” And more than half – 56 percent – of the deadly crashes occurred in or very near intersections. The commissioner credited speed cameras for reducing crashes and injuries near parks and schools. She said that in locations where cameras were installed in 2013, there were 18 percent fewer injury crashes in 2014, compared to only a four percent reduction citywide. The total number of crashes in 2014 at locations with speed cameras fell two percent, while crashes were up by six percent citywide. Hanss said that nowadays in Chicago, fewer than 3,000 pedestrians are struck annually, and the decline in pedestrian crashes is occurring at a faster rate than the city’s overall decline in crashes. Because people on foot are more likely to die if a crash occurs than any other type of road user, CDOT is focusing its efforts on reducing pedestrian crashes, Hanss said. Fourteen percent of pedestrians involved in collisions are seriously injured or killed, compared to only 1.2 percent of all people involved in crashes. Hanss said 65 percent of pedestrian crashes occur within 50 feet of an intersection. Among crashes where the pedestrian’s actions at the time of the crash are known, in 46 percent of the cases the pedestrian had a walk signal. “We don’t have pedestrians who are just jumping out into traffic,” he said. Charlie Short, who manages CDOT’s Bicycling and Safe Routes Ambassadors program noted that the ambassadors partner with police officers to do outreach to motorists about pedeestrian safety laws. For example, they inform drivers of the state law that requires them to stop for pedestrians in crosswalks. “I’m curious to see how that works, because I don’t experience that,” said Bob Gallo, the Illinois director for the American Association of Retired Persons. “I see a lot of rule breaking, and a lot of motorists in crosswalks.” He said he walks to work downtown and hasn’t noticed any improvement in driver behavior over the years. “It’s my observation that red light running is epidemic,” Gallo said. “If red light running was a disease, the [Centers for Disease Control and Prevention] would quarantine Chicago. I know the police are doing the best they can, and other jobs they have are more of a priority.” He suggested that red light camera locations be chosen based on the amount of foot traffic at an intersection, in addition to the number of crashes. Short also discussed a new Safe Routes for Seniors program that CDOT piloted last fall. The ambassadors visit senior centers to talk with residents about their safety concerns. He said they are trying to connect seniors with services that are already available, by informing them about how to report issues to 311, reach out to elected officials, use transit and paratransit, and design safe routes to places they need to visit. Curious if the 46% figure, while not very important, indicates that only the walk sign is on, or if the “flashing don’t walk” (countdown) is included as well. I personally don’t believe Chicago’s Vision Zero adoption truly matters, because Vision Zero as adopted by other American cities now is designed to be a failure. There is no way we are getting to 0 fatalities on our roads within the stated timeframe and with the budget we have. The political will does not exist. Agreed, if it requires the slowing of traffic and people complain to the alderman about the changes, it will never go anywhere. Has to come from the top with no restrictions. Yes, it has to come from the top, but the public will must ultimately influence the top to consider safety for active transportation a significant priority. I am often in Chicago for business and many other cities throughout the world. Chicago has a very deadly combination for pedestrians in my opinion that go beyond the normal issues of the danger of vehicles turning on green, speeding and red light running. Chicago has installed pedestrian crossings at uncontrolled intersections and mid block in some cases. Although these crosswalks are an absolute necessity to make the city pedestrian navigable, they currently offer no protection. It gives pedestrians a false sense of security. In my most recent trip I attempted to cross Milwaukee to the city side of 5 corners a few times. I am athletic and wanted to see how drivers would react to me. The crosswalks offered zero protection. I even had drivers speed up upon seeing me in the crosswalk. The CPD has ZERO policing of crosswalks and also don’t stop for pedestrians with the right of way. Either protect crosswalks, or rip them out and be honest in telling pedestrians that their safety is their responsibility and their’s only. This is such a waste of time. Hard to believe people actually waste their energy on something like this. And Frank, you’re right. A few years ago the state changed the law and required Cara to stop at any crosswalk. Many pesestrians feel like it’s their God given eight to step out in front of moving cars. Many don’t understand the laws of physics. They think the government is somehow going to protect them. I laugh as I speed by and they look at me like I should be stopping. Or even better, they point to some tattered sign that tells me I’m supposed to stop. What idiots! What’s even funnier is the city can’t site a decrease in pedestrian deaths after selling speed cameras as a way to save lives. What a loser. I am thinking it could run from Forest Park (at Blue Line), Oak Park (at Green Line) to the Blue line again at IRving Park or Addison or Belmont. And then the it’d connect to the Brown line at Western. And continue to the Howard CTA terminus with tunnels to the Lake at Belmont and hopefully someday other streets. Of course it’d also hook up with the 606 trail. This would be great for development of the West side. Parts of it could be elevated and incorporate solar power shelters and connect with existing or new parks and plazas. Montreal has a great subterranean city with shops and plazas underground that incorporates their Metra system. I think this would be a great infrastructure improvement and help with surface congestion and pollution. Maybe instead of electric powered L lines, there could be pedal powered solutions like rickshaws which would provide work to young people. The Danish tunnel, however, is only for bikes and pedestrians which I like. While this idea could (eventually and for much more money) include another light rail line like the EL it’d be safer and better for health and climate if it did not. Pedal powered rickshaws could provide jobs for youth and transport for seniors or other non bikers. If the mayor backed such a plan, he’d have my vote and provide many years of jobs and infrastructure development and investment in more of the city than just the lakefront and downtown. You have one major advantage over New York. In Chicago, reckless drivers who kill people *actually get prosecuted sometimes*. In New York, it’s always “no criminality suspected, go ahead and murder more people”. The DAs in New York are totally corrupt. In particular, the number of people in cars who died in Chicago crashes spiked dramatically, from 63 in 2016 to 80 in 2017 -- a 27 percent increase. This year Chicago had seen 27 pedestrian fatalities as of July 31 -- a 30 percent increase over the recent average for this time of year. There were 18 pedestrian deaths this year as of April 30 -- a 45 percent increase over the previous five years.